The Vestry, along with Mary Vano, Katherine Strother, and Dwight Cowan, got together on a chilly first weekend in February at Ferncliff Conference Center to get to know new members and to reflect and set goals. We missed John Adams, whose family was sidelined with the flu. The conference room came with a huge fireplace, and Mark Magie, blessed with a servant’s heart, was kind enough to keep the fire going. We started with a social hour, during which Mary Vano worked ever-so-diligently on her kneeler. I watched enough to truly appreciate those who are giving their time to that task. Afterward, we convened with Evening Prayer and then came together to consider the Vestry Covenant in its current form and to consider changing the tone and focus of the Covenant. Not only is the Vestry Covenant a list of “to dos” for the Vestry, such as keeping watch over the property and finances of the parish, but also it sets expectations of how we approach our spiritual lives, our personal relationships, and our commitments to St. Margaret’s. 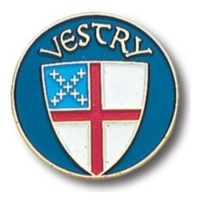 It’s what makes the Vestry more than a board of directors. On Saturday, after Morning Prayers, we started by electing our Junior Warden, Clerk, and Treasurer. Ronnie Beggs was an obvious choice for reelection as Junior Warden, and we are so very thankful for his continuing service in that role. Leah nominated me for the Clerk role, and no one else jumped at the chance, so I accepted. Dwight Cowan has graciously agreed to be the Treasurer for the coming year, and we thank him for his leadership. After working out committee assignments, we then turned to the heart of the retreat, which was to reflect on past goals – where we had successes and where we could improve – and then to set new goals for the coming year. We all agreed that last year was something to be proud of, as we had a successful capital campaign, experienced significant growth in our youth programs, and had consistently generous participation in the Backpack Program. For the coming year, we set many goals, and we divided those among the committees. The Mission and Ministry Team will be implementing a new program, RenewalWorks, about which you will hear more in the coming months, as well as focusing on expanding the Parents’ Day Out program and creating more formation opportunities. The Finance and Administration team will focus on discerning new uses for our buildings, improving financial reporting, and finding ways to make use of our resources for community disaster preparedness and recovery. The Building Committee will focus mainly on seeing the new building to completion, as well as taking care of vital repairs to the existing building. And, finally, the Growth and Evangelism team will focus on our goal of “18 in ‘18”, which is to add 18 households this year, as well as to expand use of social media to heighten awareness of our parish activities and resources in our community. I came away from the retreat feeling very inspired and hopeful for this year at St. Margaret’s. We have great leadership in Mary as our rector and Jan Thames as our Senior Warden. Together with our energetic parishioners, we can do great things.